Not enough time read now ? Helping you to reach new visualization frontiers in your research: this is our mission. Since our founding in 1976, a primary driving principle has been to develop and manufacture labeling and detection technologies that make IHC as easy as ABC. Reliable and reproducible reagents that instill trust and confidence. Simple and robust product designs that streamline workflows and allow elucidation of complex biological systems. A knowledge base of over 100 years of combined IHC experience to help you accelerate the pace of discovery. It’s as simple as that. Vector Laboratories was founded on a growing portfolio of purified lectins and lectin conjugates that helped to pioneer lectin histochemistry. These products remain a key component of our business today. In the early 1980s, we leveraged our expertise in histochemistry to revolutionize the field of IHC with the commercialization of antibody-based avidin-biotin reagents and the introduction of the VECTASTAIN® ABC system. 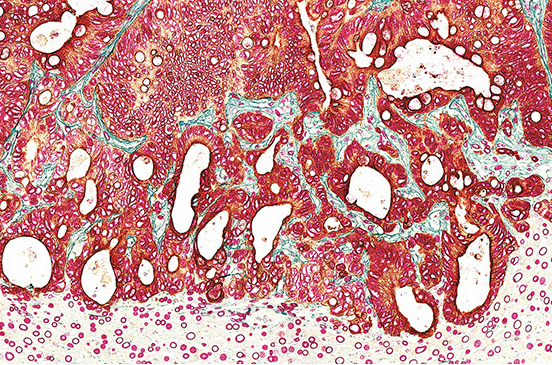 This system enabled routine laboratory use of IHC with any standard brightfield microscope. Following the success of the ABC kits, Vector Laboratories has continued to introduce many novel and innovative products to support research endeavors for cell and tissue antigen visualization. These include the ImmPRESS™ micropolymer reagents, Mouse on Mouse (M.O.M.™) detection systems, unique ImmPACT™ enzyme substrates, and VECTASHIELD® antifade mounting media for fluorescent applications. Front cover: Mouse liver section in which human colorectal cancer-derived organoids have spread. This liver metastasis shows the invading tumor front (keratin-20, brown tumor cell) growing from the top of the images towards the bottom, embedded in increasing surrounding connective tissue (fibronectin, green fibers). All nuclei of human tumor cells and the mouse hepatocytes in the lower part of the image were stained with a nuclear membrane marker (lamin A, red round shapes). Slight green staining in the lower part of the image shows connective tissue that surrounds blood vessels in normal liver tissue. (Image provided by Dr. Steffen Rickelt and Dr. Jatin Roper, Massachusetts Institute of Technology, USA). What kind of site issue are you seeing? How easy is it to find the information you are looking for on our new website? Please let us know what we have done well or what we can do better. © Copyright 2002-2019 Vector Laboratories. All Rights Reserved.